Vacations, adventures, they’re all fun all right. But excessive oil, sweat, dirt, plus bacteria are the perfect formula that can so easily translate to acne and other unpleasant skin issues. But here’s sharing with you an effective anti-acne ally: the leading anti-acne treatment product – Proactiv Solution. A solution that’s been proven over time. How Proactiv Can Address Acne? The formulation of Proactiv is gentle but effective enough to exfoliate skin as it delivers powerful anti-acne micro0crystal medicine. Exfoliation removes excess oil production. The system works as it can stand alone and may also work hand in hand with a dermatologist’s prescription. How to Achieve Acne-Free, Summer Ready Skin? 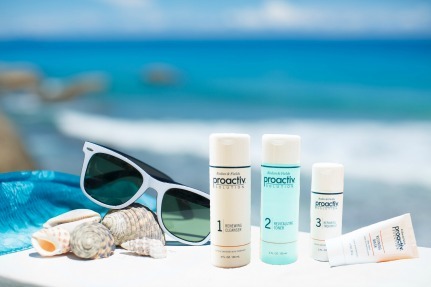 Application of Proactiv Solution can easily be squeezed in your daily regimen. It takes no more than five minutes! The zero-oil formula gives a matt finish as it paves the way to a serious fight against pimples. This medicated Renewing Cleanser is made with exclusive micro-crystal benzoyl peroxide – featuring smaller, finer particles designed to quickly penetrate pores to start killing acne- causing bacteria on contact. Tiny exfoliating beads gently remove dirt, excess oil and dead skin cells to help keep pores from clogging. This refreshing, alcohol-free toner helps remove impurities and excess oil so your skin looks and feels clean, soft and refreshed – not tight and dried out. Soothing botanical agents gently balance your skin tone. Putting off with skin breakouts does not have to be the norm this summer season. We just have to make sure we’re all set and armed with the right skin regimen.